Stevie Thompson was a explosive leaper and high scoring forward and guard, who was an integral part of Syracuse's dominating teams of the late 80's. Though listed at 6'4", Thompson was really closer to 6'2". However, he played well above the rim, as an aggressive offensive rebounder and the recipient of many Sherman Douglas alley-oop passes. Douglas and Thompson had amazing chemistry on that specific pass, and they made it look effortless. Thompson was also a tremendous defensive player, utilizing his athletic ability to defend the top guards on opposing teams. Thompson was a highly recruited player out of renowned Crenshaw High School in Los Angeles. His freshman year, he was the leading sixth man on the team, as the Orangemen came within a basket of winning the National Championship. Thompson became the starting small forward his sophomore season, replacing departing Howard Triche. Fans were electrified by his ability to soar above the rim. The kink in his armor was his ability to shoot from more than 10 feet out. He was one of the worst free throw shooters in Syracuse history (at 52.7%), and had virtually no perimeter shooting. Opposing teams would take to fouling him hard, rather than letting him get close to the basket, where he was extremely proficient at scoring (at 56%). During his junior season, Thompson raised his game another few notches, scoring 18 points per game, and shooting an amazing 64% from the field. His senior year, Thompson started the season at point guard, replacing the legendary Douglas. This move did not work out well, and freshman Michael Edwards would assume that position, with Thompson moving to the shooting guard position. When Thompson graduated, he was the school's 4th all-time leading scorer, yet never led the school in scoring in any given season. Thompson made the Big East Conference 2nd team his junior and senior seasons, was honorable mention All-American both years, and was the Big East Scholar Athlete of the Year in 1990. He played phenomenally well in the NCAA tournament, hitting 68% of this field goal attempts in the fifteen tournament games he played. 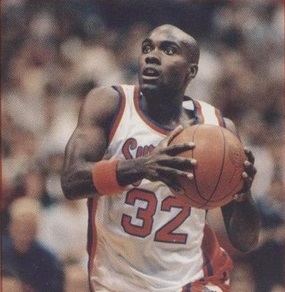 Thompson played one season in the NBA splitting time between the Orlando Magic and the Sacramento Kings in the 1991-1992 season. His size and lack of perimeter shooting would limit his success there. Thompson would play several more years of basketball, including time in the CBA, ABA, Europe and Japanese leagues. In 2001, he became an assistant head coach at California State - Los Angeles, and in March 2005, he became the interim head coach. The following fall he became the permanent head coach of Cal State LA, and within three years had coached them to their first winning season in seven years. Thompson would remain the head coach of CULA until 2014, compiling a record of 142-122. In 2014 he became an assistant coach at Oregon State. Thompson was named a Vic Hanson Medal of Excellence winner in 2007 and a Syracuse Letterwinner of Distinction in 2015.